James Clark graduated from Princeton University in 2014 with a B.A. in Religion, and is currently a student at Yale Divinity School. 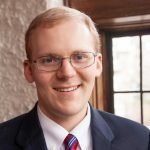 His writing has been featured at the Institute for Faith, Work & Economics, the Davenant Institute's Ad Fontes, Conciliar Post, and Themelios, as well as other publications.